Cleaning off the sugar mud! What a beautiful day we had today. It was 70 degrees F, sunny and wonderful. The grass is getting greener by the day. It was a great day to enjoy. We washed the horse’s harnesses today. 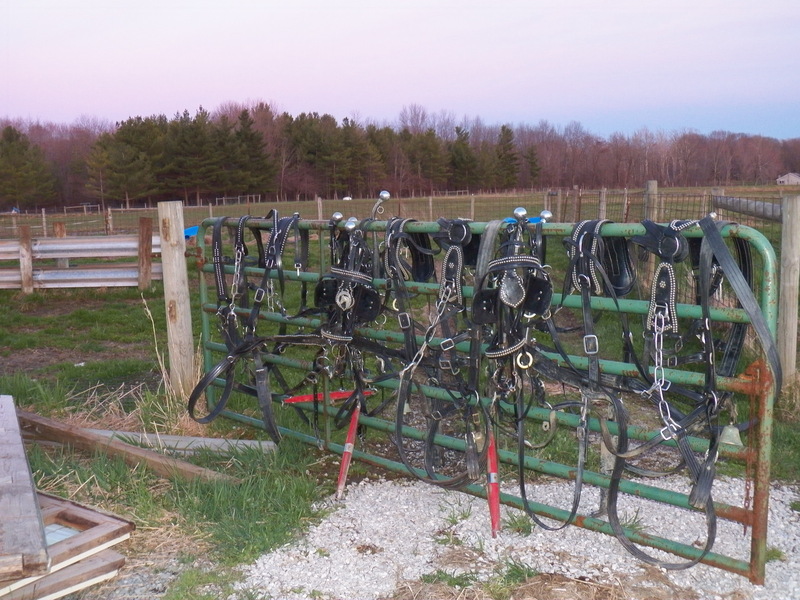 After slogging through mud while gathering maple sap, the harnesses were covered in the stuff to say the least. This is one awesome positive about my bio-plastic harness. Unlike like the heavy leather ones I had for years, these can be pressure washed and made almost new. I am pleased with the results. As I was enjoying the day and making plans for the days to come, my phone rang. It was a call I had been expecting, but not wanting to get. My friend in Pennsylvania who has been battling cancer for the last three years, lost his battle today. It was with mixed emotion and heavy heart that I spent the rest of my day. My friend is in a better place. His pain and suffering are now gone, but I am selfish, wishing he was here at plowing time. He lived his entire life farming. Almost all of it, horse farming. What I mean is, he used horses to do 99% of his farm work. They even pulled the feed cart twice a day to feed his steers. He was a man who loved breaking and training colts. He had an eye for young stock. They loved his voice and manner and responded to him easily. He was quite a guy. A great friend who I will truly miss. So, I will celebrate his life every time I pick up my lines. He will walk my fields with me just as my ancestors do. I will tell his stories and keep him close. I will let him live through me. Rest in peace Jonathan Lawton.